Rising high during the chilly autumn nights is a dazzling cluster of bright stars that are often confused for the Little Dipper by those unfamiliar with the stars. Many dread the appearance of this brilliant cluster for one reason only; seeing it rise earlier each night means that winter will soon return. Fittingly, the icy blue-white brilliant color adds to the sparkling chill of the magnificent Pleiades, also known as M45. The Pleiades are known from Greek mythology as the Seven Sisters and six of the stars are grouped into the shape of a tiny dipper that can be seen in dark skies. Atlas is the father of the Pleiades and is the handle of the dipper while his daughters; Alcyone, Merope, Electra, Maia, and Taygeta form the bowl. A few dimmer stars can be seen with the unaided eye, which includes Pleione, wife of Atlas, shining near it. 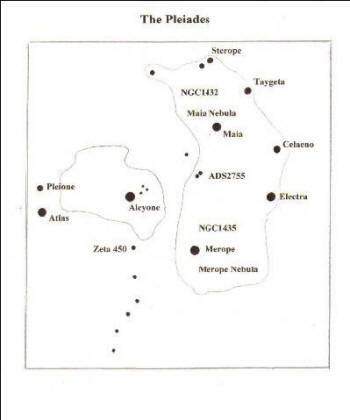 Sterope is north of her sister, Maia, and Celaeno is between Taygeta and Electra. Many other stars are also visible and a small telescope can reveal nearly 60 dimmer stars. A larger telescope will reveal over twice as many, but a small telescope is the best way to explore the Pleiades along with the diagram included with this article. Use low power when first observing the Pleiades to fit the entire cluster into a single field of view and to gain an appreciation for all the stars. 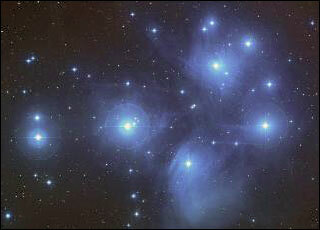 The brightest stars of the Pleiades are bluish-white because they are young and extremely hot. The stars are associated with each other, being born as a cluster only around 100 million years ago; they are about 400 light years away. Amazingly this means that the Pleiades may have begun to shine in our skies around the time the dinosaurs roamed the Earth. Several stars of the Pleiades show nebulosity, but this nebulosity is not the birth cloud that created the cluster. It is only a lucky coincidence that the cloud is passing through at a time when it can be appreciated. The nebula is brightest, largest and most easily seen around the bright star, Merope, where it spreads most noticeably to the south like a blue mist, reflecting Merope’s light. Here it is known as the Merope Nebula or NGC1435. Look for nebulosity surrounding Maia also; it is appropriately called the Maia Nebula or NGC1432. To confirm if nebulosity is actually being seen, simply compare Merope and Maia with Atlas and Pleione since there is no nebulosity surrounding these stars. The Pleiades have other stars that show different colors. A pair of 8th-magnitude stars known as ADS2755 can be seen near the center of the dipper’s bowl. One star is white and the other is orange, providing a beautiful contrast with each other and the blue-white stars of the Pleiades. A chain of stars runs southward from Alcyone that has a few golden stars near its southern tip, and there is also a very close double star, Zeta 450. Many of the bright stars of the Pleiades are doubles including Sterope and Taygeta. Alcyone also has a tiny triangle of stars very near and just north of it. The oddest star of all is Pleione. It spins so rapidly that it is squashed into a shape resembling an egg, or an oblate spheroid. This causes it to throw off a plume of gas causing it to brighten and then dim before returning to its usual magnitude. From 1972 to 1987 it ranged from magnitude +4.8 to +5.5. Many cultures have stories regarding the lost Pleiad, and the variability of Pleione may have led to only six of the brightest stars of the Pleiades to appear visible most of the time with the unaided eye. It often takes plenty of searching and a large telescope to find something beautiful, but the Pleiades prove that nothing more than a small telescope is needed in order to enjoy one of the finest open clusters the universe has to offer.